Why did the names of some of the worst Roman emperors start with the letter 'C', as in, Caligula, Commodus, and Caracalla? I am not talking about the the emperors who only wore the purple for a short time, but those who at least had a few years in their reign. I am not a big fan of the Roman Empire; most of my reading is done during the period of the Republic. I have to say that this book is truly an amazing gold mine of military history and everything else you would want to know about the Roman army during this time. Caracalla, or more correctly, at birth Lucius Septimus Bassianus, and later Marcus Aurelius Severus Antoninus was described by Gibbon as "the common enemy of mankind". The author of this book cuts through 1800 years of slanted history to give us the real story of the man and his rule. The book even goes into the history before his birth and after his death. This book has worked its way into the top five of my favorite books. For someone who has been reading voraciously for fifty-three years it is quite an accomplishment. The writing is superb, and it still amazes me what the author has packed into a little over three hundred pages. The book is also filled with pictures, some colorized, maps and diagrams. This is a one book encyclopedia of Roman history and military during the middle part of the empire. When you can take a subject that the reader normally doesn't care about and turn it into a page turner, that is something few authors have been able to do. 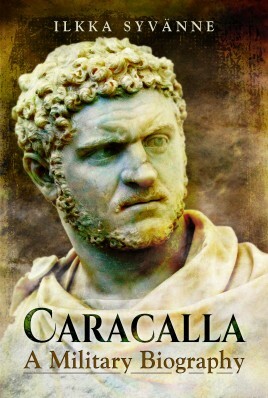 Caracalla has been one of the poster children for despots for many years. To bring his story into perspective and help the reader rethink his views on a much maligned man is not an easy task. To be honest, the author does not try to make him a Boy Scout, but to bring the history of the time alive for the reader to judge for himself what he would have done in the same situation. Since Caligula, the emperor had been a marked man. Except for the time of the 'good' emperors - Trajan to Marcus Aurelius - the man in the gilded seat seems to have had a target on his head. Very few of the Roman emperors died in their beds, at least of natural causes. Oddly enough, Caracalla's murder seems to be one of the very few where the Roman Army was actually upset over his demise. Usually they were in the plot thick as thieves. I cannot praise the book enough. From the illustrations to the diagrams that show how Caracalla tried to emulate the army of Alexander the Great, the information in the book is priceless.